It’s been a while since my last “Ask Marla”, so I’m offering up a two-part piece on a matter of concern to all tennis players: foot faults. Many players foot fault, but most don’t know how to stop. So I asked Marla about foot faults, and some tips to help fix them. Part 1 covers tips to correct foot faults, and Part 2 will cover other aspects of the serve that can contribute to foot faults, such as chasing your toss or inadequate knee bend. Question: Do you have any tips to help players check if they foot-fault and fix it if they do? Answer: The easiest thing a player can do is to back away from the baseline before hitting their serve. I don’t like doing that, however, because you give up valuable ground if you only have a marginal serve. The better alternative is to figure out which feet step over the line, and then work to stop them. Try setting tennis balls in front of your feet when you serve: one in front of lead foot and one to side where back foot pulls up. Whichever ball moves (i.e. gets kicked or stepped on) will let you know the offending foot (or feet). Afterward, you can adjust your serve accordingly to better anchor your feet (for greater serve accuracy), and to better minimize potential foot faults. Of course, the best option for checking foot faults is to have a friend take video or pictures of your serve along the baseline. This will clearly show which feet cross the line on your serve. 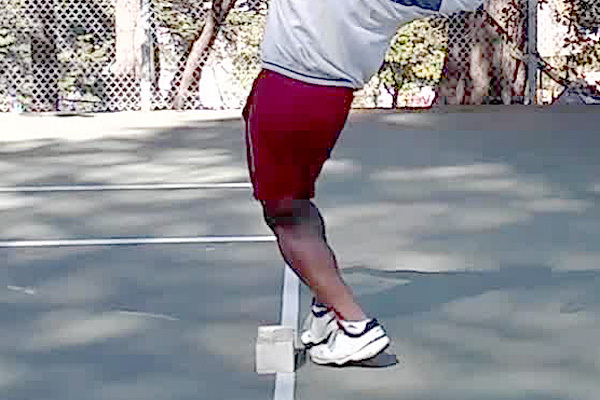 (SFTF Note: I’ve also struggled with foot faults. After watching a ton of matches with top-ranked players, I noticed that many barely move their feet when serving. 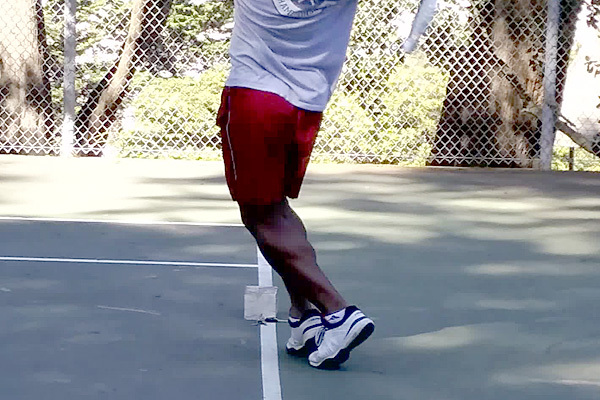 So I’ve recently begun anchoring my front foot, the usual offender, to help clean up my service footwork. I also tried Marla’s tennis ball option to catch any movement across the line, but also used other items such as my keychain, a spare racquet, and a brick. The brick actually proved to be the most helpful for me because of its’ size. There’s no way I could deny hitting it on the line if I crossed. The pictures at right shows a practice serve with the brick. The picture series below shows my cleaner footwork afterward. All pictures were taken by my phone on a tripod. The brick is a great tool, but pictures are indeed worth a thousand words! Whatever option you use on the baseline, try to supplement it with pictures or videos. Chasing your toss across the line, or losing power because of knee bend now that your feet are anchored? Stay tuned for Part 2. Got a tennis question? Send it via email or tweet for “Ask Marla”.